The next day it was still raining but we had places to go and things to see. 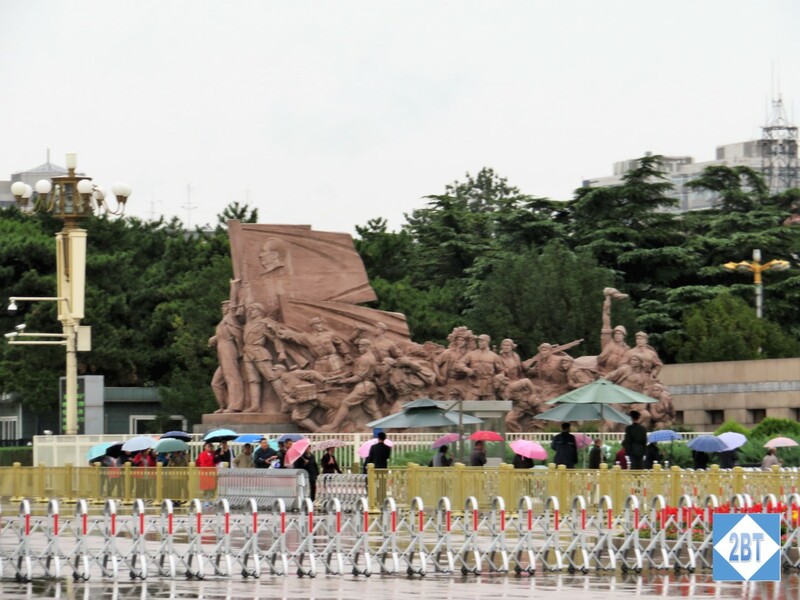 At the top of the list was Tiananmen Square. 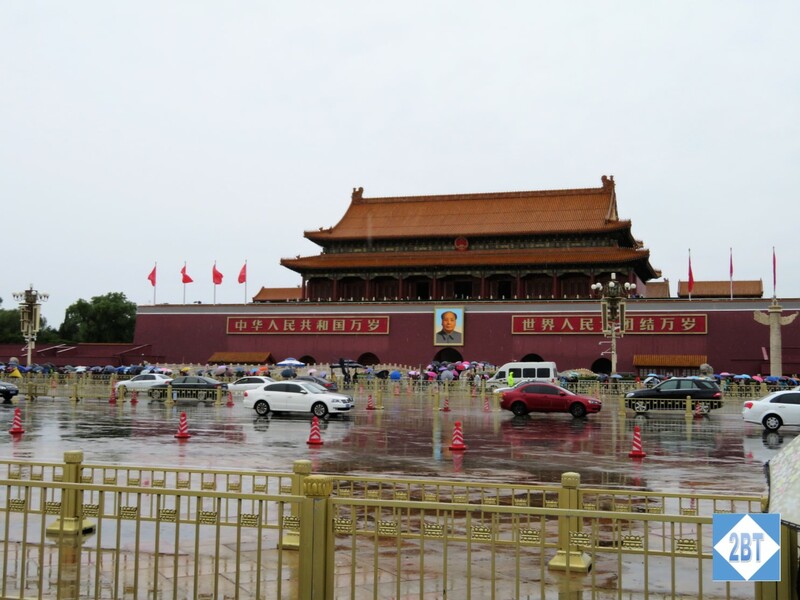 “Tiananmen” means “Gate of Heavenly Peace”, which is the name give to the giant red gate with Chairman Mao’s portrait that separates the square from the Forbidden City, which is just to its north. 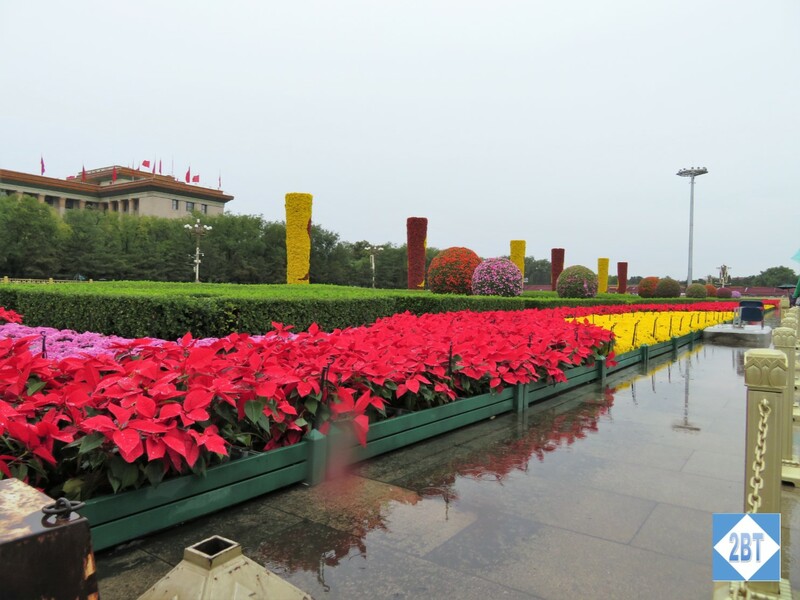 Based on size, it is among the top ten city squares in the world at 109 acres. It is notable for a number of protests, first in 1919, then in 1949 when Mao made the proclamation of the People’s Republic of China, in 1976 after the death of the first premier of the PRC and most recently in 1989 when a man famously stood in front of a line of tanks. Our guide told us that the man later disappeared and no one knows what happened to him. 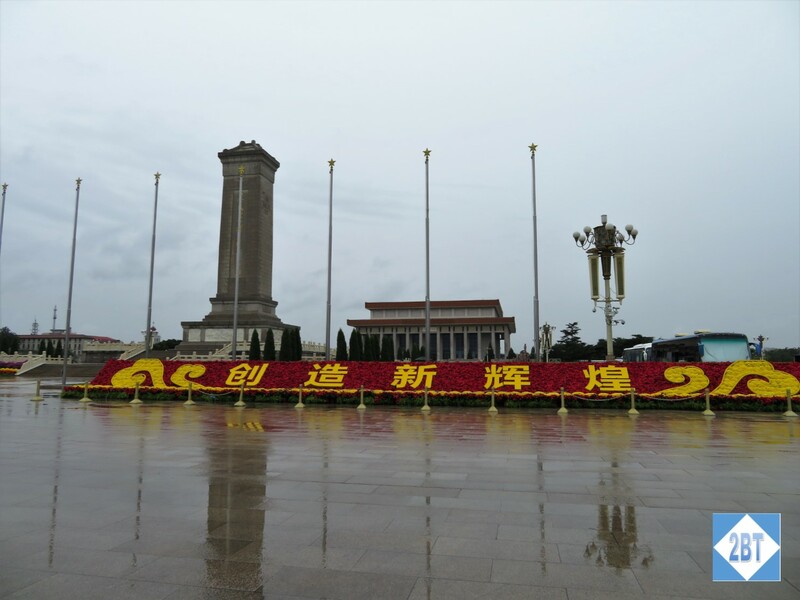 China’s National Day is October 1st so we had arrived a week after the national festivities, which was good timing. 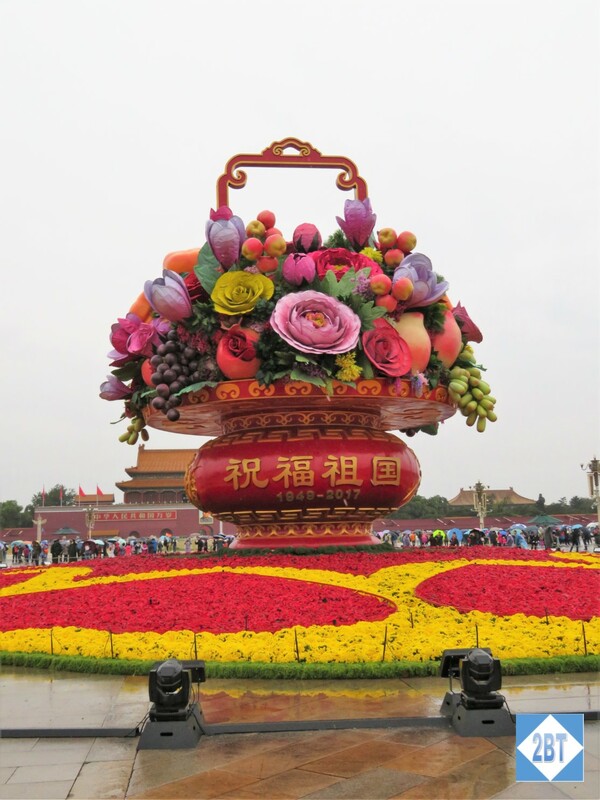 In the midst of the square was this giant floral arrangement in celebration of the holiday. And the flowers along the sides were glorious as well. On the east side is the National Museum of China. We were told and have read online that this is an excellent museum but we did not have time to visit. 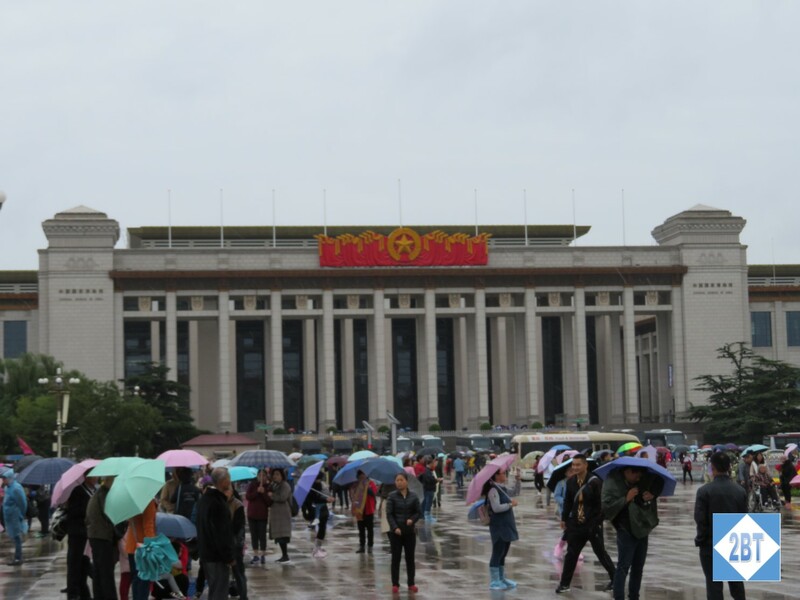 The Great Hall of the People is on the west side of the square. 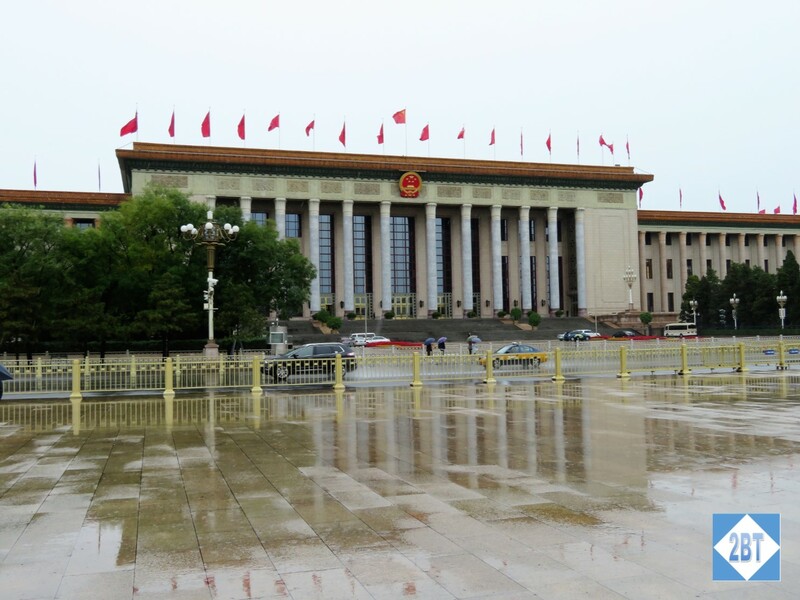 This is where parliament meets as well as the National Congress of the Communist Party of China. On the south side is the Zhengyangmen Gate, a structure that remains long after the city walls were demolished. 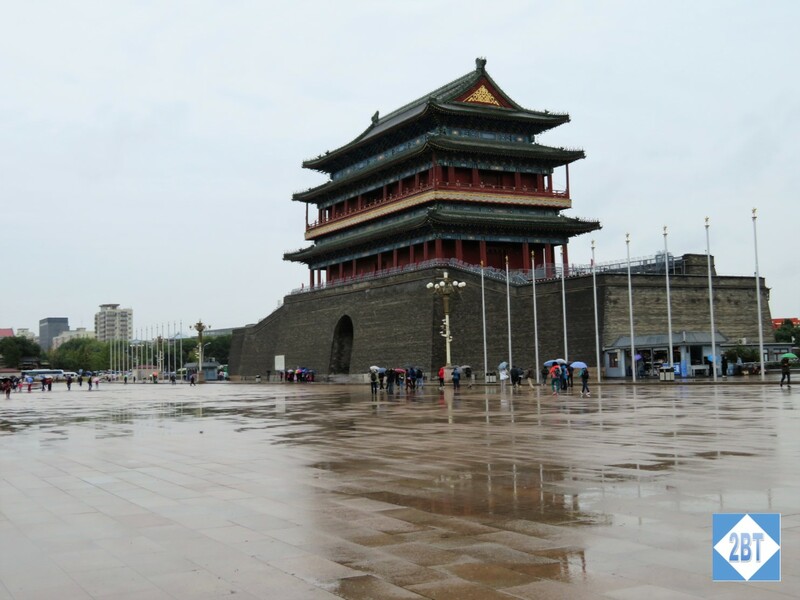 It was first built in 1419 during the Ming dynasty. In the center is the Monument to the People’s Heroes which memorializes the martyrs of the revolutions of the 19th and 20th centuries. It is nearly 125 feet tall. 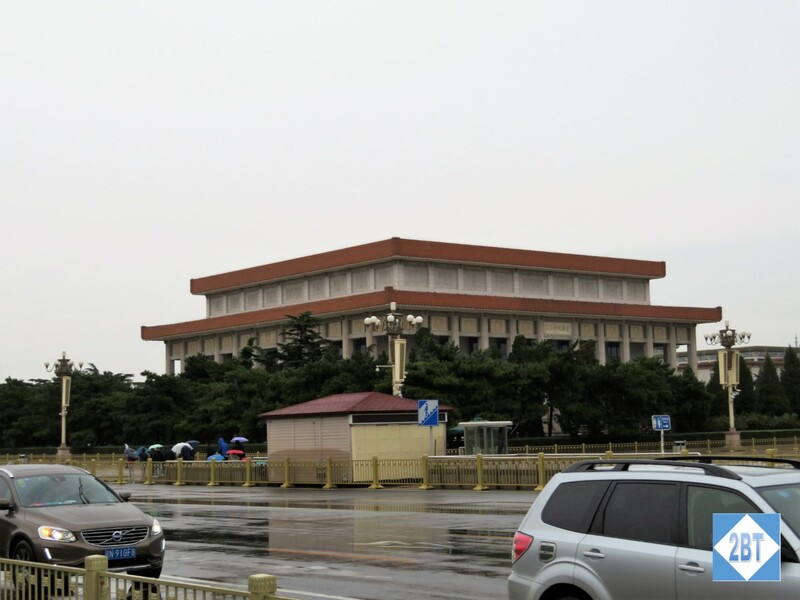 On the south side of the square is the Chairman Mao Memorial Hall, better known as the Mausoleum of Mao Zedong. Though he wished to be cremated, his body was embalmed and is still on display inside a crystal coffin. We did not go inside due to time constraints but I bet that is a fascinating tour. This sculpture is near the tomb. It appears to be a number of different types of workers uniting in support of Mao, whose profile is etched into the large rock. The rain was starting to let up a little bit as we made our way toward the Forbidden City via the tunnels under the street. We may have even lingered a bit as we tried to get dry. But soon enough we were making our way upstairs to our next “must see” attraction. Thanks! Glad you’re enjoying it.